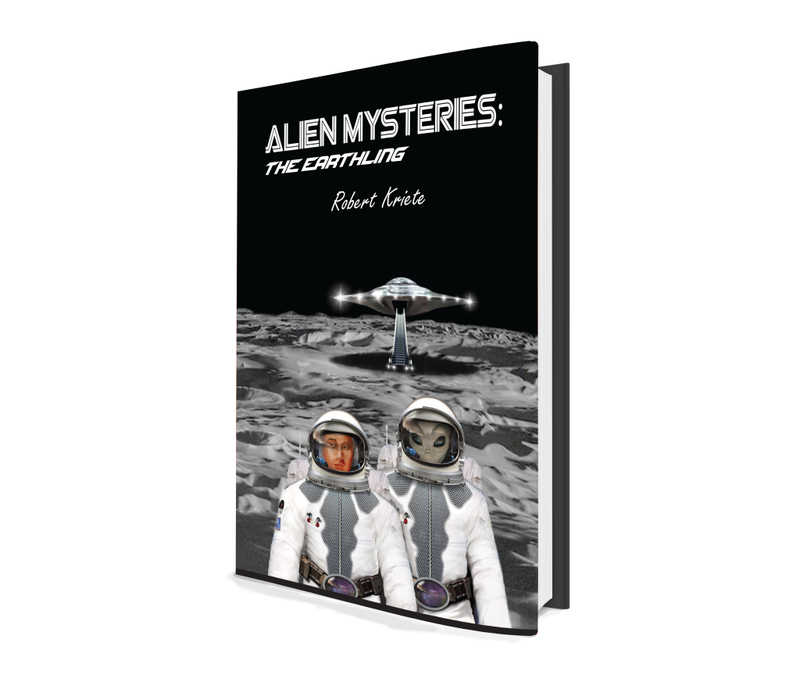 Buy Alien Mysteries: The Earthling by Robert Kriete now! $13.00 in paperback, $26.00 in hardcover, or $5.95 in eBook! “For nearly a week, a man is missing in Death Valley, California. When he is found, surprisingly he is not only alive, but he is healthy and virtually untarnished by his ordeal. On the way back to the bosom of his wife and grandchildren, he recounts an incredible story to his son. It is a story of epic proportion—too fantastic to be believed yet too detailed to be fabricated. Author Kriete’s novel is not just another tale of alien abduction. His story is an involving blend of scientific fact, theory, and fiction, wrapped around an extrapolation of worlds beyond our own that offer hope for the one in which we dwell. It tells the story of a middle-aged engineer accidentally beamed up into a spacecraft and befriended by a higher life form that takes him on a marvelous journey. It is a journey not only of adventure, but also of expanding knowledge as the engineer queries the alien and learns of events in the past, present, and future that have been, are, and will be, influenced by forces beyond human capabilities or consciousness. A man goes missing in the desert for nearly a week. Just when all is presumed lost, he turns up none the worse for wear and is even healthy and hardy. What has happened to Dr. Maxwell Fairmont? It’s an extraordinary experience that defies all his scientific training and which will change and challenge his life. Alien Mysteries: The Earthling is a different kind of alien abduction story; in part because its main protagonist is an engineer whose training directly conflicts with his experiences. More so than most alien encounter sagas, the story line injects a healthy degree of science into its fictional coverage, so readers delighted by the presence of “hard science” in their novels and sci-fi adventures will relish these devices in Alien Mysteries: The Earthling, recognizing that this is part of what sets Kriete’s story apart from similar-sounding plots. What is the real source of miracles, and when does alien intervention make sense? As the story unfolds, scientific details back fantastic concepts to create many thought-provoking moments: “Is that what happened to people claiming to have had cancer or another incurable disease that disappeared out of the blue, Doc? All verified by doctors? They said that it must have been a miracle. Were you or some of your colleagues responsible?” “What do you think, Max?” As when Max first met him, Doc had a twinkle in his huge eyes that hinted at his amusement, since the aliens didn’t have the muscles in their faces to smile or laugh. Max then knew the answer. Audiences interested in hard science tend to not be the same readers as those who enjoy alien abduction stories. Perhaps this is because the latter genre tends to be adventure-oriented and too often eschews science in favor of the psychological drama surrounding extraterrestrial scenarios. But Alien Mysteries: The Earthling is not your typical alien encounter read, and thus it will draw neatly from more scientific circles while keeping the thriller/adventure leisure reader thoroughly engaged. As Max’s story takes unexpected turns and results in escape and unusual alien alliances, readers surge along for a wild ride through time and the fabric of space itself. While those anticipating a lighter treatment might chafe at the scientific passages, a wider audience will find that its depth and detail adds satisfying complexity to the story, making Alien Mysteries: The Earthling a recommendation not just for fans of alien abduction sagas, but for any who would appreciate the unique blend of science and thriller that Robert Kriete cultivates.